I’d spotted two grand porticoes from the upper deck of the bus on Western Road many a time but it took a visit from the Greek Ambassador to really hit home their importance to me. 139 and 140 Western Road – known as Codrington Mansion and Hampton Lodge respectively – both have fascinating links to the great war hero, Admiral Sir Edward Codrington (1770-1851). A terrace of nine houses known as Codrington Place was built in the 1820s of which Codrington Mansion was numbered 8 and 9. Much of the terrace is now beneath Waitrose though some of the buildings now exist as flats with their gardens as commercial premises on Western Road. Hampton Lodge adjoins Codrington Mansion and was Codrington’s home from 1828-32. Each appears to be a fine structure but it’s difficult to say due to the number of modifications which have taken place. One more building, just around the corner, has taken the name of the great man – Codrington House at 1 Hampton Place. 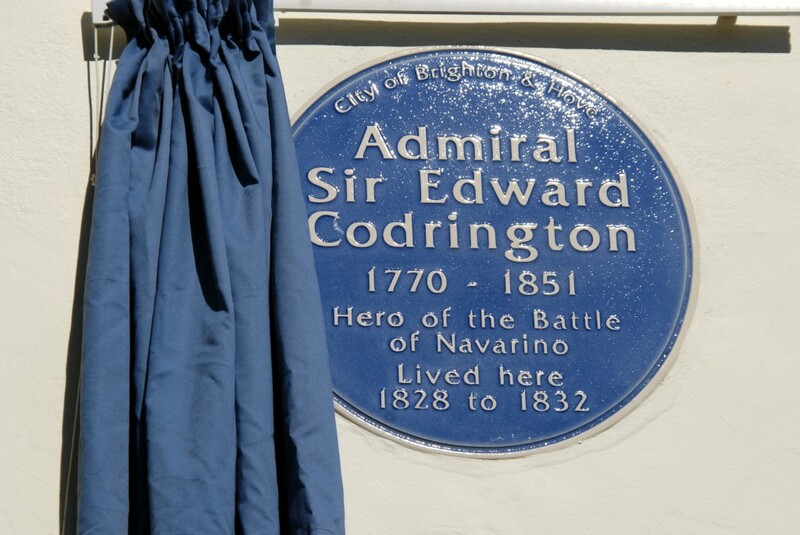 Codrington really made his name at sea at the Battle of Navarino on 20th October 1827 when the combined British, French and Russian fleet which he was commanding destroyed the Turkish and Egyptian fleet during the Greek War of Independence. There is a large obelisk dedicated to the memory of him and the other officers at Navarino at Pylos in Greece where he is certainly known better than he is in Brighton. The lack of proper recognition locally has been a great shame bearing in mind Codrington’s important role in the creation of Greece as we know it today. 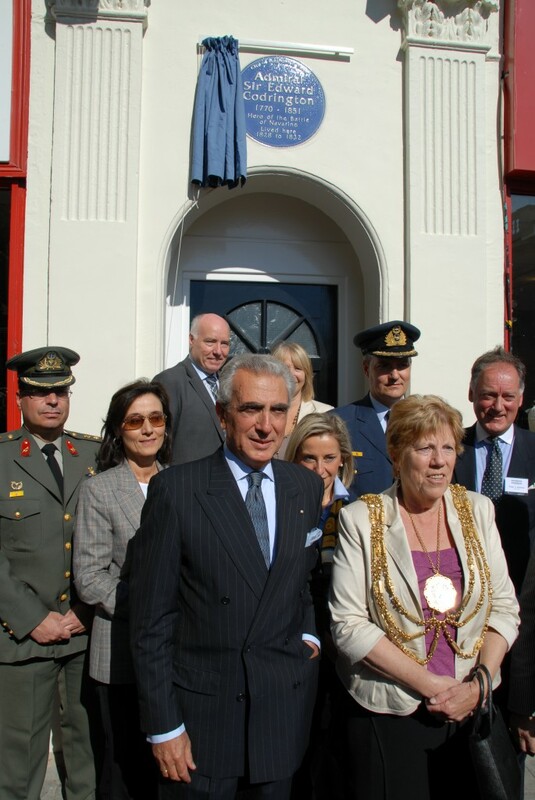 A blue plaque on 140 Western Road, Hampton Lodge, was unveiled on 29th September by the Greek Ambassador in the presence of the Mayor of Brighton & Hove and a huge number of other local and, for that matter, international dignitaries. I know that Roger Amerena and his Montpelier & Clifton Hill Association colleagues have been campaigning for such a commemoration for some time so it is an excellent result for the area and also for the memory of the Admiral. The revival of the blue plaque scheme locally in a big way is a fitting way to remind residents just who has been living on their doorsteps. Other recent additions include Max Miller’s plaque on Marine Parade, Charles Augustin Busby’s on Lansdowne Place, Dame Anita Roddick’s on Kensington Gardens and Peggy Ramsay’s on Kensington Place.